Walter was the son of Sir Walter Calverley of Calverley on the outskirts of Leeds, and his wife Julia Blackett, and educated at Balliol, Oxford. It was through his mother that Walter came to inherit the Blackett estates in Newcastle and Northumberland when his cousin, the third Sir William Blackett (1690-1728), died without any legitimate offspring. The terms of his inheritance were that Walter Calverley had to change his name to Blackett and, within a year, marry Elizabeth Ord, William Blackett III’s illegitimate daughter. Both terms were complied with, and as Sir Walter Blackett he enjoyed the estates until his death in 1777. He held several public positions, serving as MP for Newcastle between 1734 and his death, High Sheriff of Northumberland in 1731–32, alderman of Newcastle and Mayor five times. The Northumberland estates were heavily in debt at the time of his inheritance in 1728, the legacy of a severe depression in the lead trade around 1712-3 that Sir William III’s extravagant lifestyle over the subsequent 15 years had done nothing to eradicate. Walter Blackett was not a businessman but was astute enough to recognise and support the talents of his agents, and solid management by father and son Joseph and Henry Richmond over the next 50 years turned the estate’s fortunes around. By the 1750s Blackett was able to promote and invest in a variety of ‘infrastructure projects’ the results of which can be seen to this day: a variety of turnpike roads which greatly improved Northumberland’s internal trade, the enclosure of Hexham Common, and the construction of the Hexham marketplace Shambles. He was benefactor of numerous charities in Newcastle. The Richmonds provided him with the raw material for informed comment on canal proposals, the bread used in the area, and also confirm the power over the city which he wielded and which gained him the title of ‘uncrowned king of Newcastle’. Wallington Hall, however, was his preferred home and he was responsible for the hall much as it is today, its grounds and nearby walled garden. The Gainsborough portrait of him there (see above) depicts a heavily built squire with penetrating eyes set wide apart in a kindly face. Although he could treat any tenant who incurred his displeasure with ruthless severity he was considerate and generous where he found what he thought of as genuine misfortune. He died in 1777 having presided over a half century of steady improvement in his estate’s fortunes. Several years earlier Blackett had sold his Yorkshire estates at Calverley to pay off debts secured on Wallington and to remove it from the trust estate inherited from his Blackett ancestors. This was to prevent his beloved Wallington descending to his disliked cousin Sir Thomas Wentworth of Bretton, next in line to the Northumberland estates under the terms of William Blackett’s will, once it became clear that Walter would also die childless. 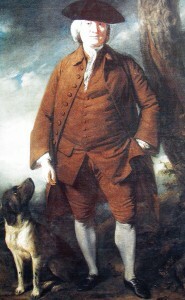 Instead he bequeathed Wallington to his sister Julia’s family, the Trevelyans.